Over the weekend fancy people in an “acquisitive mood” milled around Frieze Art Fair, discreetly making it rain while rubbing shoulders with art dealers, the dapperly dressed, and a donkey named Sir Gabriel– an animal brought there by an artist who recently broke a personal record when his statue of Hitler sold for $17.2 million at auction. Back in Bushwick, however, less absurd things were going down at a very different kind of art happening. 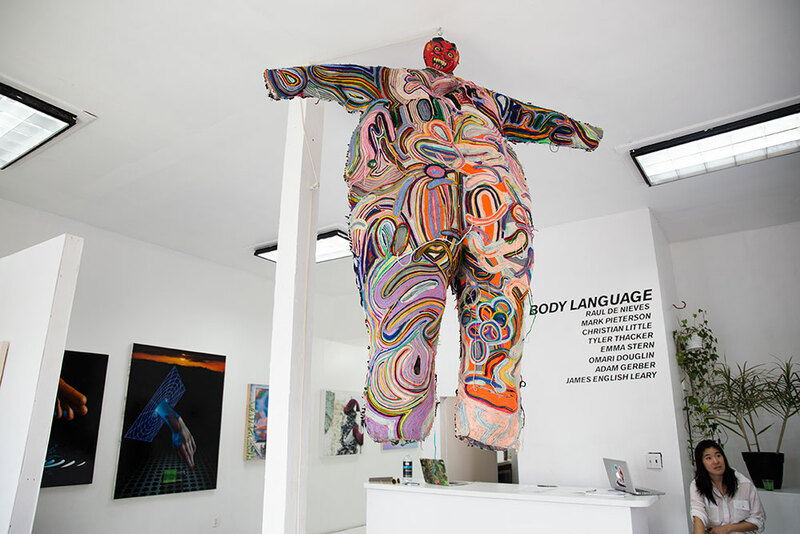 As far as we can tell, there wasn’t a VIP section at the opening night of Body Language, the second art show to happen at Angelina Dreem’s art and technology educational hub, Powrplnt, and the first one dedicated to paintings and other 2D works by emerging and established artists. Where, I wondered, does one without children find children? “Everyone asks that, and it’s funny because there are kids everywhere– if you try, how can you not reach kids?” Angelina Dreem found my question pretty funny. Dreem is the artist and the founder of Powrplnt, a non-profit organization dedicated to providing underserved kids (and sometimes adults) with access to digital tools and technology. Angelina recently dubbed it “a net art school for indigo children,” on Twitter. “I feel like there is a real invisibility in the hipster world of everybody else who lives in New York City– it’s like, ‘Well I don’t see them at the bars,’ but for real, there’s a lot of kids.” Touché. But now I’ll have no excuse about wondering where to recruit children for dastardly deeds, because they’ll be all in one place: Powrplnt just landed an IRL place of its very own in Bushwick, the organization’s first permanent space. “We’ll be starting the first round of classes in January, when the kids get back to school,” Angelina explained. But first up, there’s a fundraising event tonight (featuring the inimitable Junglepussy, believe it or not) and some very orange walls to get rid of immediately after. “On Monday, I’m definitely gonna start painting it white,” Angelina said. Fresh off its 120th anniversary celebration, Third Street Music School Settlement is ready to face the future with a $5.3 million construction project. Proposed renovations include a state-of-the-art recital hall with acoustic paneling that promises to “envelop audiences in the sound of music,” the school announced today. The city will spend $150 million to transform nearly 100 schools as part of a new “No Bad Schools” program, Mayor de Blasio announced today. Today while the rest of us were celebrating Stephen Colbert’s succession of David Letterman, Mayor Bill de Blasio was celebrating himself. Specifically, his first 100 days in office, which he marked in a speech at Cooper Union’s Great Hall. Students of the college brought back the red “Free Education To All” banner that made several appearances during the doomed two-year battle to keep Cooper Union tuition-free. It didn’t last long. 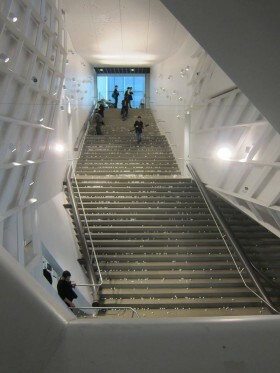 Cooper Union wants it to be known that you can’t just unleash 2,100 ping-pong balls on a four-story staircase and get away with it. In a campus-wide e-mail forwarded to B+B, Alan Wolf, the school’s safety coordinator, says he wants the ping-pong protesters to be held accountable. Here’s the full statement, in case you were about to bulk order some Slinkies. The grand staircase at the Thom Mayne-designed Cooper Union academic building at 41 Cooper Square connects four floors of the nine story building in a single, unbroken sweep. Now imagine it blanketed with ping pong balls. No need to imagine, because it happened yesterday.